You couldn't have put together a better production to showcase Toller Cranston's gift as an artist than Strawberry Ice. At times psychedelic, at times spiritual, at times playful and theatrical and exciting from start to finish, Toller's TV special Strawberry Ice had it all. The opening music grabs you immediately and for all of you people who grew up in the 90's like me instantly says "Gangsta's Paradise" and the Michelle Pfeiffer movie turned Annie Potts miniseries "Dangerous Minds". It's Toller in the city and the story is staged out of a flat where he's opted to take a nap among his amazing art. 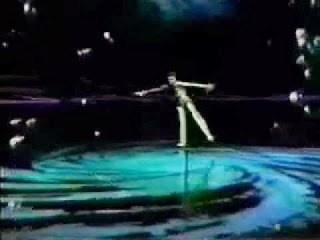 An out of body experience almost depicted like astral projection takes Toller on a series of dream like adventures on the ice that combine fantastic music, emotive skating and the most expressive and dynamic movement you can ask for to create this fascinating flow of different stories that piece together one by one. It's got everything - not just Toller's larger than life skating and his brilliant "Firebird" program, but Sarah Kawahara, Peggy Fleming, Allen Schramm, Sandra Bezic and the most amazing costumes, which were designed by 4 time Canadian and 2 time World Champion Frances Dafoe and incredible stage sets and imagery. Strawberry Ice came out in 1982, the year I was born, but there's nothing at all dated about it at all! It was ahead of its time and still has that relevance, excitement and freshness when it comes to theatre on ice today. The soundtrack itself is a gem full of music perfectly suited to each fantasy sequence. Chita Rivera also complements the skating cast with her rich voice as well. When I think Chita Rivera, I think back to my 10 year drag "career" and performing to "Spanish Rose" from "Bye Bye Birdie" (which I loved doing, by the way!) but she shines here just as much as she has on any Broadway stage singing "Fever" in a skating/music marriage with Toller and Shawn Jackson with "Movin' On Up" is just larger than life! It's really epic by performance standards. In Kelli Lawrence's book "Skating On Air: The Broadcast History Of An Olympic Marquee Sport", even Kurt Browning talks about the impact of Toller's early TV specials: "My mother and I enjoyed watching his specials and were amazed by everything about them. They were an adventure in skating!" I'd love to live in a world where you turned on your TV set and saw amazing productions like this every day and it warms my icy heart to look at the fantastic work groups like The Ice Theatre Of New York, Le Patin Libre and Robin Cousins' Ice (among SO many others) are doing to stage artistic skating for live audiences. I can't say I'm a huge fan of these live singer based shows but I've been proven wrong there - I just loved the Holiday Festival On Ice with Holly Cole, who I'm a big fan of. That said, what Strawberry Ice had and has is timeless and I felt it was necessary to have a good old fashioned gushing session about it on here just so that many of you who haven't seen it might take that hour on a Sunday or while lying on the couch or in bed one day and say, hey, I'm going to watch this (or watch it again). It really is special and we could honestly ALL use a little more Toller Cranston in our lives. Was this feature on Strawberry Ice a time? Well, don't just stand there! In order for this blog to reach a wider audience, I could sure use a little help. All you have to do is "LIKE" the blog's Facebook page at http://www.facebook.com/SkateGuard for instant access to all of the new blog articles, features and interviews as they are made available. I also share daily updates and headlines from the skating world, videos and much more that's not here on the blog, so if you love figure skating as much I do, it would really be rude not to get on that inside edge! You can also follow all of the fun along on Twitter at http://twitter.com/SkateGuardBlog. If you know someone who loves skating, tell them! It's all about getting a dialogue going on! Fabulous skating is too fabulous to keep secret. Am I right or am I right?